The inability of our generation to provide a sense of meaning is an inability that arises when words have been “used up”, when they have been spoken too often, dealt with as too self-evident, mechanically reproduced and thrown at us in a relentless flow of information that this is happening and that is happening, that this has happened and that has happened, that this will happen and that will happen, that this, that that, until finally meaning itself has dissipated like so much smoke blown to the wind. To retain their meaning, words have to be reforged in silence. Delillo, a central figure of literary postmodernism, has such a reputation that even the thinnest of his books is expected to be compulsive reading. Point Omega however, with its hundred or so pages is not much of a story. More a fait-divers, a single moment of time taking place in an isolated metal and clapboard shack lost in the middle of the desert. Critics have complained about the novel's brevity and its apparent lack of plot and weak characterization. They are wrong for they fail to see that this economy of means and props, rather than a sign of weakness, shows an immense talent at work. Richard Elster, the main protagonist, is a scholar who has worked for the strategic department of the American Army during the Iraq war. Richard has retreated to his hideout in the desert. A young man, Jim Finley has joined him. Finley wants to make a documentary about Elster and his war –time experience. The film is supposed to be as spare as possible, just a man against a wall, a talking head. Days pass by, the two men sit on the deck, drinking and talking. The film, we understand, will never be made, but the reader of course gets what the film is trying to record: the conversations, the opinions, the sayings of Elster. Then enters a young woman, Jessy, Elster’s daughter. She is bit weird, a bit different. Elster explains that she is very intelligent and remarks that she can determine what people are saying in advance of hearing the words by reading lips. Jessy does not seem to fit in easily with the two men. A drama is in the making. Structurally, the desert part is framed between two chapters titled Anonymity and Anonymity 2, respectively dated September 3 and September 4. In these two chapters, one an intro, one a coda, we are in the near empty room of the museum of Modern Art in New York, where the conceptual artwork 24 Hour Psycho by Douglas Gordon is exhibited. 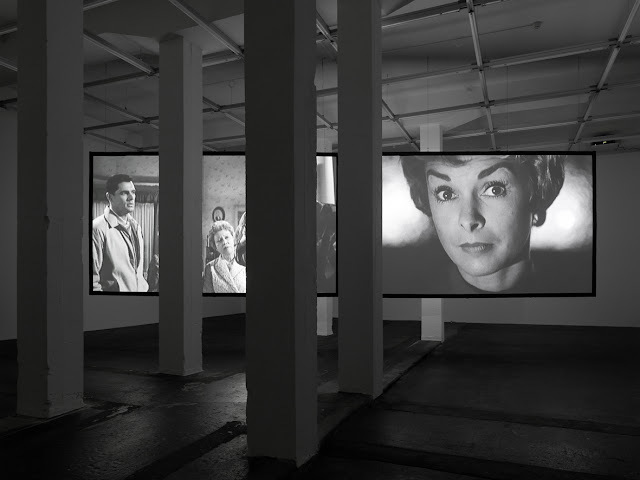 In this artwork Alfred Hitchcock’s movie is projected on a big screen ( which can be viewed from both sides) but slowed down to two frames a second, rather than the usual 24. Instead of 109 minutes, it takes exactly 24 hours, at that speed to project the entire movie. A man stands alone in the dark and looks at the movie. Because it is slowed down to that near static pace, he sees things you normally don’t see at a normal pace. While he knows the film by heart, he still discovers things for the first time. But one senses that his fascination for this slow black and white stream of images is obsessive in a kind of awkward autistic way. The two chapters taking place in the Art museum are not unrelated to the central part, the one which takes place in the desert. In the first part, two men enter the projection room, who we later understand to be Jim and Elster. Jim still has to convince the old man to participate in his film project. In the second part a woman enters and makes acquintance with the lonely viewer. We suspect the girl to be Jessy, Elster’s daughter, and the viewer might be her secret lover. What do these two parts say about the middle piece or how do they improve the novel altogether? The themes Douglas Gordon wanted to elaborate in his art work were supposed to be "recognition and repetition, time and memory, complicity and duplicity, authorship and authenticity, darkness and light." This does not help much unfortunately. What I think Delillo’s purpose is, is to show what he is doing to the narrative in the middle section: slowing down time and action until it appears to be a standstill. Thanks to that we are allowed to see things we would normally not see, things which in the blur of the normal speed of everyday life would remain hidden. Imagine the four parts of the middle chapter as four movie “frames”. Time stands still and we can observe every image in their minutes detail. While the negative critics mostly complained about the “slow moving non-plot” and saw it as a major fault of the novel, it didn’t bother me. The attentive reader can easily fill in the blanks. From a handful of lines emerges what could easily constitute a 1000 page tome. Elstir, the fallen Academic, has fled to the desert or hidden in the desert. He is ashamed or angry about his participation in the war machine. His daughter has a mental problem. She has probably inherited the bad genes from him. Elster could not save his marriage. It probably made things worse for his daughter. Jim Finley has run away too from a badly gone relationship. Too much occupied with his work etc etc. We understand it all. We, as experienced readers have read it all before. Delillo knows that, and therefore he doesn’t need to elaborate. He only has to find the right words, The few words we need to get the message. How sure are we that our interpretation is right, that it reflects the story as Delillo meant it to be? It is not important, there are many truths and realities and each reader chooses his own. More important for Delillo is that we understand other issues. First of all, the three characters are lost. No Gps, maps or off road cars will help them find back a meaning to their lives. They have reached the end of the road. The desert enhances this feeling of isolation and helplessness. Secondly, the different characters cannot communicate with each other. The father not with his daughter, Jim not with Jessy, the Mother not with the father, the partners not with each other. All their socialization and communication has come to a grinding halt. Third, while biological sexual drive still pushes male and female towards each other, albeit in an awkward unconvincing way, the future is barren we understand, as barren as the desert around them. This could be the end of our species. Autism is the metaphor of the book because autism is characterized by impaired social interaction and communication and by restricted and repetitive behaviour. The four characters in the Omega book all have a problem. The man on the wall (in either manifestation) and Jessie are obviously symptomatic. Jim and Elster are no better. The signs are there: Jerry Lewis, Psycho in slo-mo, war as haiku, the desert with Elster's solace in it as signifier for total annihilation, the word rendition. We are, according to Delillo, truly in the age of autism. A first obvious clue to understand what it is all about is the title. Point Omega is an idea conceived by the French Jesuit priest Pierre Teilhard de Chardin ( 1881 -1955 ) in his law of Complexity and Consciousness. Teilhard de Chardin was a paleontologist and geologist of international renown, who took part in the discoveries of the Piltdown and the Peking Men. Observing evidences of the evolutionary history of the earth, Teilhard thought that matter would grow in complexity, from inanimate matter, to plant-life, to animal-life, to human-life and at the same time become more conscious. He summarized his theory in his book The Future of Man (1950), and called it the law of Complexity / Consciousness, where the universe is constantly developing towards higher levels of material complexity and consciousness. The mechanism behind this evolution is a kind of gravitation towards a singularity, the Omega Point, a critical threshold, a supreme point of complexity and consciousness. And here comes the catch: this “suction” – force exists, transcendent and independent of the evolving universe. Teilhard is trying no less than reconciling science and religion. The Omega Point is Christ drawing all things to himself. At this point consciousness will rupture through time and space and assert itself on a higher plane of existence from which it can not come back. For Teilhard, the law continues to run today in the form of the socialization of mankind. The closed and circular surface of the earth contributes to the increased compression (socialization) of mankind. As human beings continue to come into closer contact with one another, their methods of interaction continue to complexify in the form of better organized social networks which contributes to an overall increase in consciousness. It is an exciting idea: The 'Omega Point' of the title "...[is] the possible idea that human consciousness is reaching a point of exhaustion and that what comes next may be either a paroxysm or something enormously sublime and unenvisionable." The protagonists have reached the Omega point and have come to a standstill. Immobilized like the desert and the stones around them. One Critic remarked that “with his lean, spare and concentrated prose DeLillo is, after Beckett and Robbe-Grillet, the indisputable master of grinding a plot to the brink of stasis and then recording its every last movement. Point Omega seems like a logical endpoint of that quest." One of the protagonists will indeed disappear. Sucked into the ashes and dust of the desert? Disintegrated in something enormously sublime and unenvisionable ? Back to anorganic matter? No one knows. Another one has to be evacuated out of the desert in a state of total regression, nearly suffocating in his own organic slime as if pure intellect has reached the edge of what it can endure. When criticized about the brevity of his novel, Delillo answered that this was not deliberate: "Each book tells me what it wants or what it is, and I'd be perfectly content to write another long novel. It just has to happen." This is obviously not true. There is meaning in such shortness especially if we set it against other post modernistic behemoths like “Gravity’s rainbow” or “Infinite Jest”. To convey whatever Delillo wants his novel to convey it has to be made short. Delillo makes sure that the key for “the shortness” is to be found in the lines of the book and it is a second clue as how to understand it. Somewhere early in the second part falls the word haiku. A haiku is a very short form of Japanese poetry written in three lines of respectively 5, 7 and 5 “sounds”. The haiku expresses in a classical shape a “moment” of “experience”. A Haiku is a thimble full of emotion without any space for descriptions or analysis. Is Delillo’s book a haiku? The shortness and the three parts seem to indicate that this is the intention.The novel is structured as to provide the illusion of self-contained meaning. Lines one and three take place on September 3 and then September 4. The desert part is the middle line. Once we reach point Omega, and we make abstraction of the religious emergency exit, then this book seems to say that to cope with greater complexity and consciousness, solace lies in the self-contained, self-defining idea of the Haiku. That is why the real Sage, the man who has gone the way of the Mistic, the one following his via negativa does not need long discourses on why and what and who. A simple Haiku is enough and a Haiku is what Delillo has brought us with this book.